I am taking the day off to visit a friend, look at eagles, and play roulette. I have my regular favorite numbers based on important dates in my life. Now I have two new favorite ones: 5 and 12. 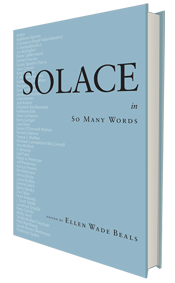 That’s because Solace in So Many Words launches on May 12. I don’t expect to make a wad at the roulette table nor will I blow one, and that’s okay with me. I want to blow off a little steam, get a little charge, maybe misbehave a little. But lucky? The way I look at things lately, I already know I’m lucky.